Top Colorful Lakes On Earth.Nature blesses human with various kinds of breathtakingly beautiful sightseeing. Among them, there are numerous beautiful lakes around the world which feature a variety of unusual color of water. 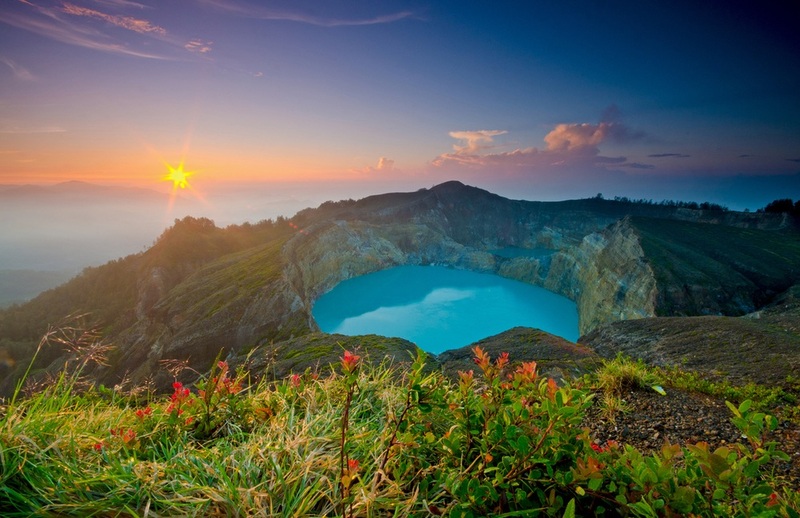 The Kelimutu Volcano has three crater lakes on Mount Flores. The uniqueness of Lake Flores is three lakes showing three different colors. While Tiwu Ata Mbupu is totally blue, Tiwu Ata Polo is a reddish hue and Tiwu Nuwa Muri Koo Fai is green. Three colorful lakes on the same volcano crest have been of much debate and interest so far. Until now, the most explanation lies in the earth’s crust. More interestingly, three lakes gradually become light green since the end of 2008. Saltwater Laguna Verde Lake, located in the high plains of Bolivia, is famous for hot springs and beautiful surroundings. Besides, the lake features an amazing shade of green which is caused by debris with copper deposits. The distinct colorful water in Lake Pukaki has created centuries ago. The "glacier blue" together with snowy peaks are the most visited tourist destination in New Zealand. Havasu Falls, a part of Havasu Canyon in Grand Canyon, is only accessible by a helicopter. The beautiful color results from carbonate minerals which act as a reflector for brown mossy cliffs and green forest. Lake Nakuru, the greatest bird spectacle on earth, is home to millions of lesser flamingos. Unfortunately, the number of flamingos is being affected due to environmental pollution. The Plitvice Lakes are complex of sixteen lakes which are famous for mesmerizing waterfalls and deep water surrounding. Band-e Amir consists of a chain of six colored blue lakes in Hindu Kush Mountains of Central Afghanistan. The lakes get breathtaking color from cracks in the rocky landscape and high mineral in the water. The Laguna Colorada gets reddish color from red sediments and algae. Besides, it is the home to a variety of flamingos. Moraine Lake in Banff National Park has stunning blue water thanks to glacier flour. The Jiuzhaigou Valley of China is home to a variety of turquoise-colored lakes which are extremely clear enough for tourists to see the bottom.